Please bear in mind that this article was written over two years ago. When prices are mentioned, please allow for this delay as current prices are often a far cry from those quoted. This article was published in The Carnival Pump in September 1993. Several years ago I did a color spread in the Pump on red. Since this is one of the few colors that has kept pace with aqua opal and the other pastels, it is time we take another look at this intriguing phenomenon. 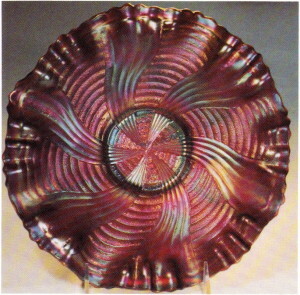 Using the latest issue of the Carnival Glass Auction Prices as a guide there were some 335 pieces of carnival that sold for $1000 or over at auctions during the year. Of that number 38 were red, 29 ice blue, 27 aqua opal, 19 ice green and 9 white. This is remarkable when you consider the limited number of red pieces that are sold each year. Some of you auction goers out there like this color more than you are ready to admit. The Gone-with-the-Wind lamps are perhaps the rarest and most desirable of the red pieces. The Regal Iris and the Sunken Hollyhock top the list and are certainly in the $10,000 plus category. The Roses and Ruffles will go for substantially less. 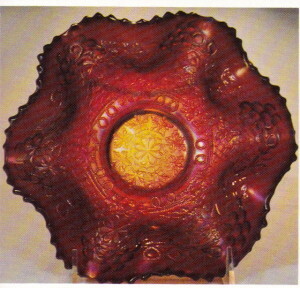 The Peacock lamp is also found in red, but it tis not the Gone-with-the-Wind style. 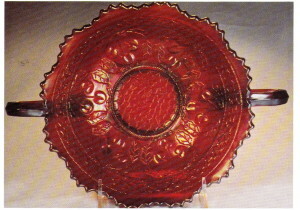 In fact, it is not even red as it gets its color from the red paint on the interior of the clear but iridized body of the lamp. It is much more available and will sell in the $1000 range. Fenton dominated the red scene, producing some 35 to 40 patterns in this color. Imperial’s contribution was meager by comparison. 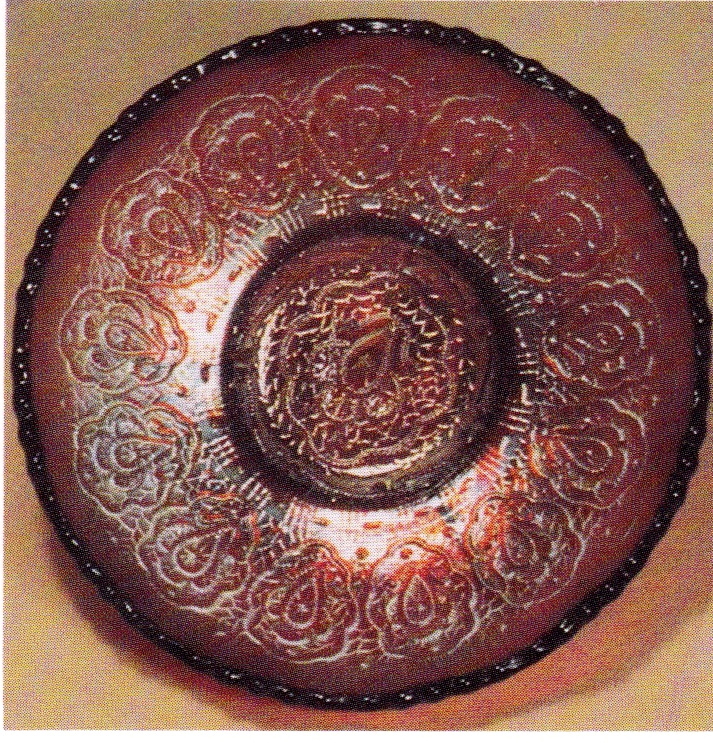 Only their Luster Rose and Fashion pieces have received much attention. To my knowledge Northwood, Cambridge, Dugan-Diamond, Westmoreland, and U.S. Glass made no red. Many of us have had a love-hate relationship with red carnival. This seems to relate to the wide range in the intensity of the base color and the inconsistency in the iridescent spray. Red is a hard color to stabilize and will range from cherry red to brick red to amberina. This when couple with a heavy dark iridescent spray can lead to some less than beautiful results. A piece can lose some of its appeal when a piece has to be held to a strong light to determine its color. 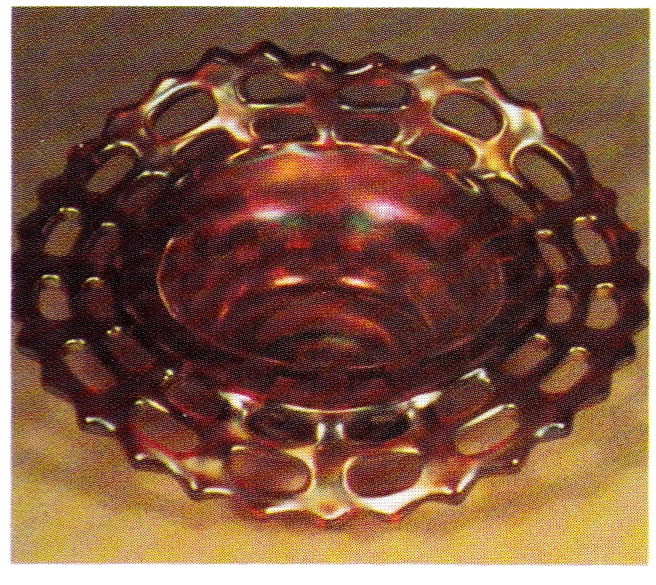 The most prized combination is a cherry red with a clear iridescent spray. 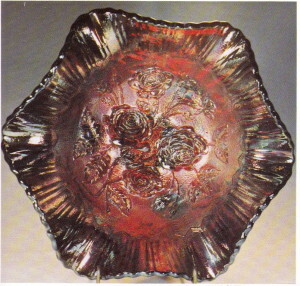 Luster Rose – Imperial’s contribution. At least a dozen or more of these showy pieces are known. Sold at auction for $2300 in April 1990. Little Flowers – A knock out. Five or six known. 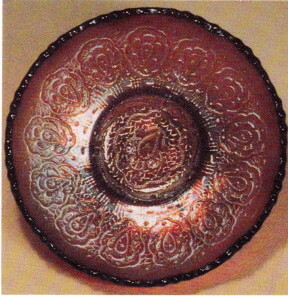 Sold privately for $5000 in 1990. Leaf Chain – Usually has a touch of amberina. Scarce but they do turn up now and then. Four sold in 1900 with $900 the top price. Open Edge Basket – The most available of the red pieces. Comes as shown or in a larger size with Blackberry interior. Nine of the smaller size in various shapes sold at auction in 1990 for from $225 to $325. Those with the patterned interior will bring slightly more. 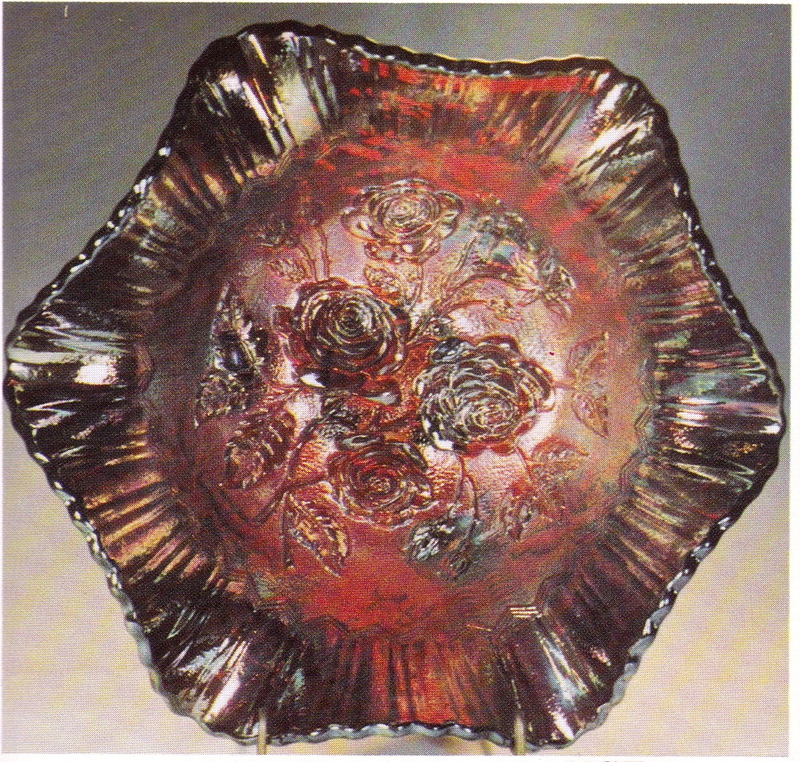 Two Flowers – The small size spatula footed bowl as shown last sold in August 1989 for $1800. 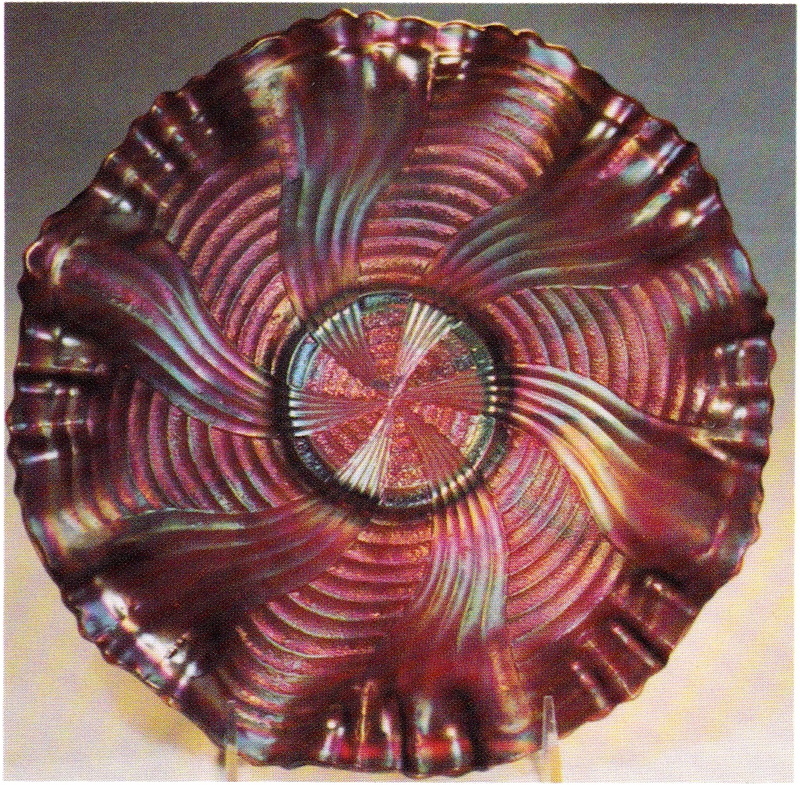 Only two of the large ball footed bowls in this pattern are known in red. They are super rare. 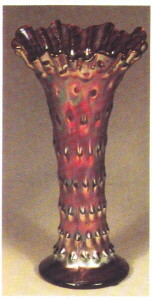 Rustic Vase – Not many of these around – maybe four or five. Has not sold at auction to my knowledge but should come in somewhere in the $2250 to $2750 range. Cherry Circles – This large bonbon seldom offered. My best guess would be in the $3500 category. 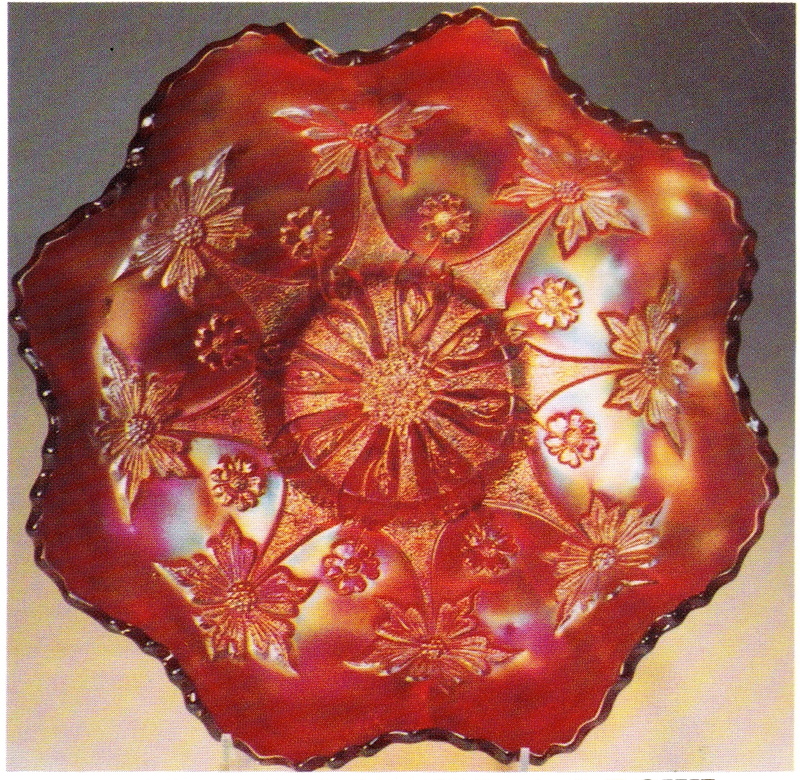 Plume Panels – Scarce but a couple are usually offered each year. Sells in the $500 to $650 area. Ribbon Tie – A rare one. Can confirm three. I think of it as $3500 to $4000. Wide Panel – Seldom seen. This is really the Butterfly and Berry vase without the pattern. Sold last year (1990) for $450. 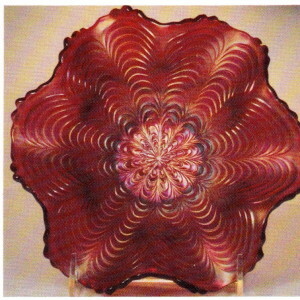 Chrysanthemum – One of the most desirable of the red pieces. 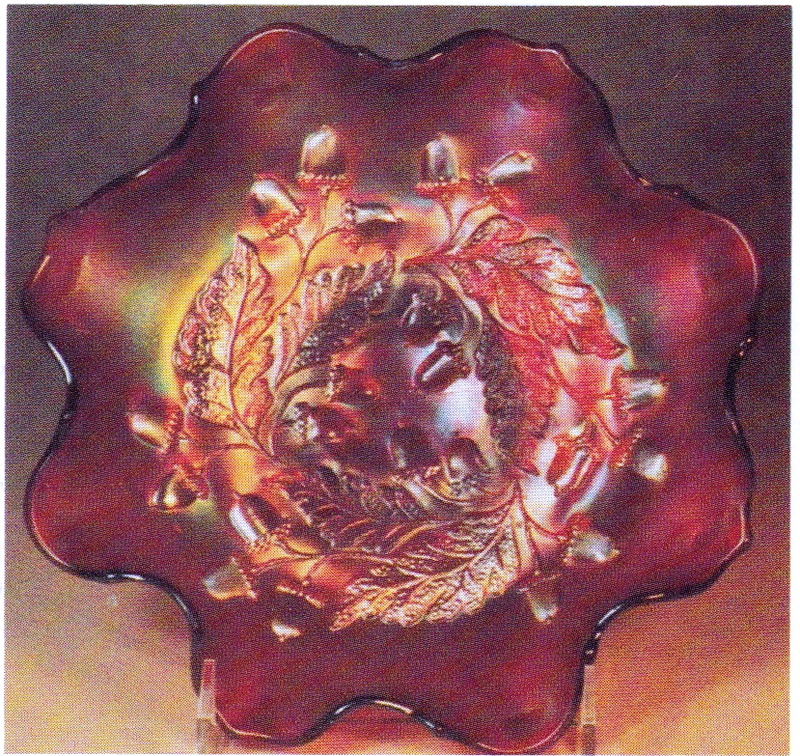 A choice one sold two years ago (1989) for $3600. 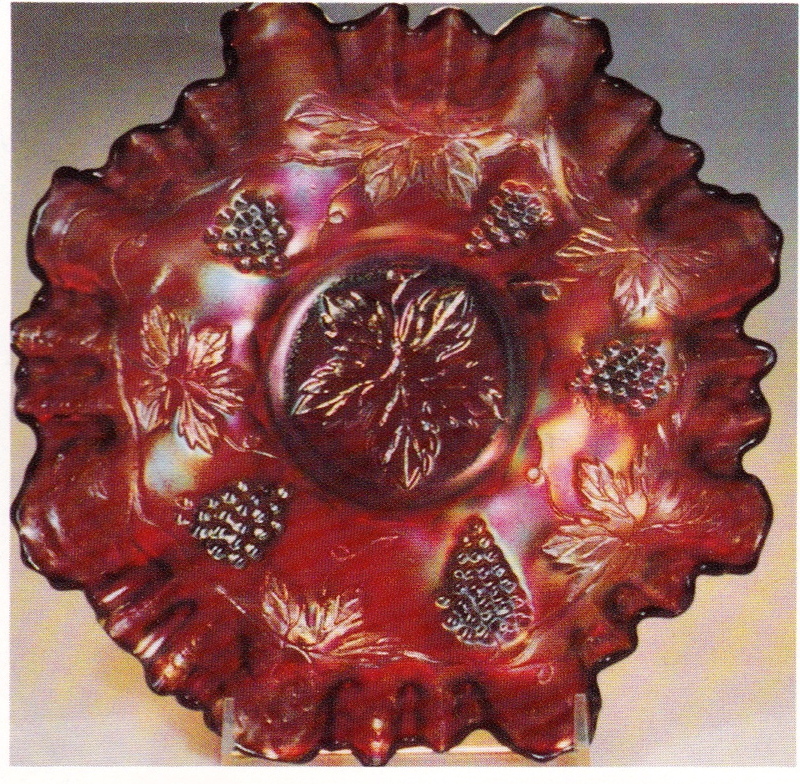 Orange Tree – A common pattern, but always in demand in red, particularly in teh ice cream bowl shape. Brought $1800 in 1989. 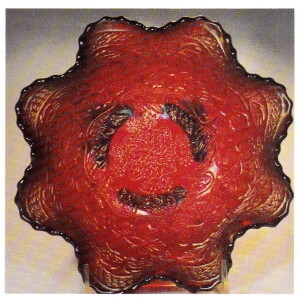 Vintage – Comes in red in two sizes – the 8 1/2” size as shown and the large 10” size. Again a common pattern but very scarce in red. The three-in-one ribbon candy edge shown here is a scarce and desirable added feature. Don’t know that one has sold at auction, but my guess is $3500. Acorn – One of the more available red pieces. Not to be confused with Autumn Acorn which was not made in red. 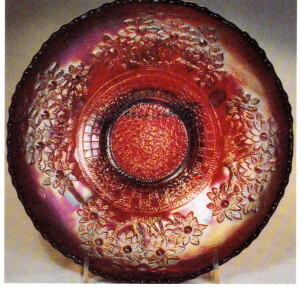 Eleven bowls in red sold in 1990 with a price range of $350 to $625. 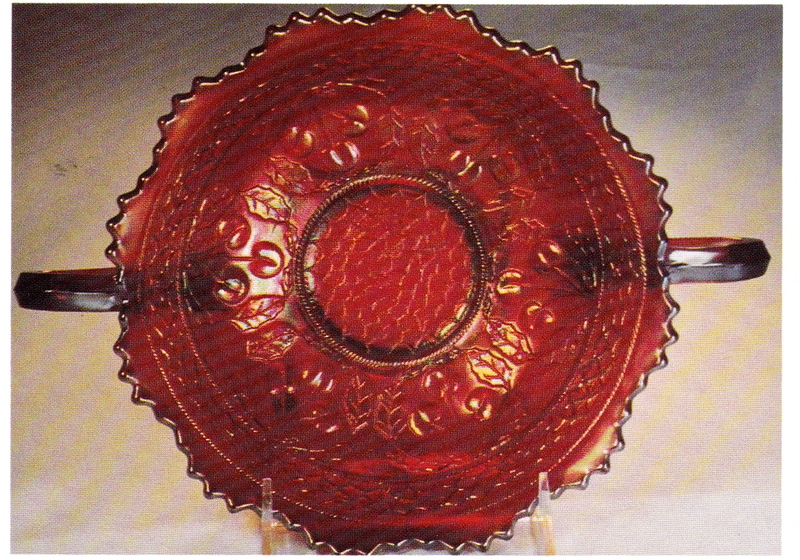 Persian Medallion – Seldom seen in red in either the sauce or the 9” bowl. Much more available in the bonbon. The 9” bowl sold for $2050 in 1989. A sauce should bring around $750. 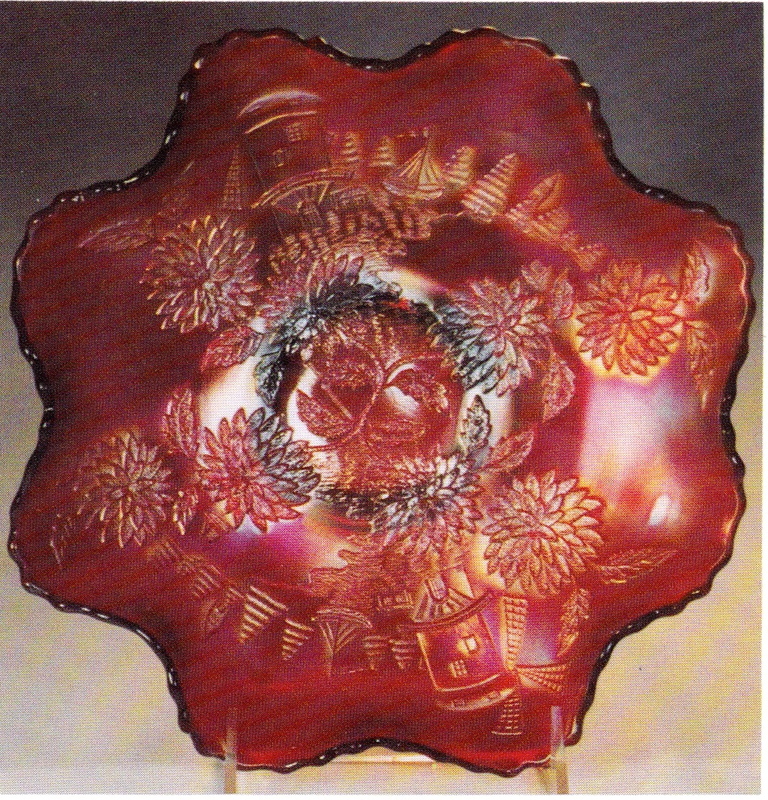 Peacock Tail – In my experience, this has been one of the toughest red pieces to find. Only one has sold at auction the past ten years. It was silvery and brought $850 in 1990.